MADERA, Calif. (KFSN) -- Looking for some free Friday night fun in Madera? Well, a pop-up event in Downtown may be just the thing. 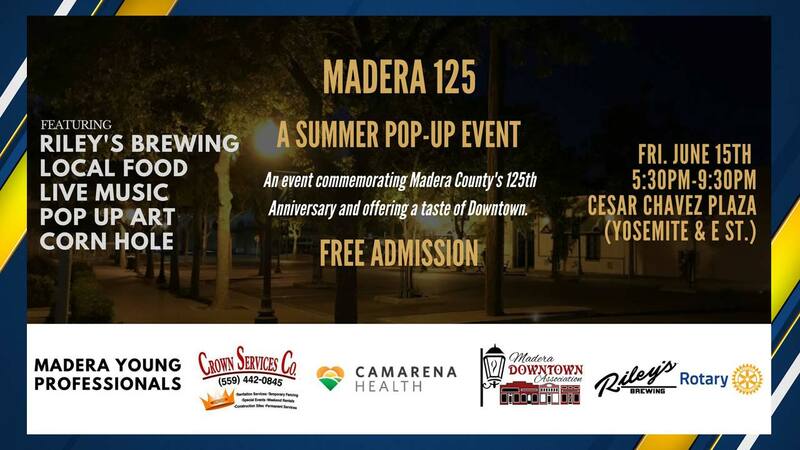 Madera 125 will be held on June 15th at Cesar Chavez Plaza. there will be live music by The Experience, beverages from Riley's Brewing, corn hole, great food, and family fun. The event is commemorating Madera County's 125th anniversary. It starts at 5:30 p.m. and goes until 9:30 p.m. Admission is Free.